London's first monkeys lived in the Tower of London's remarkable menagerie, which existed from as early as 1210. Monkeys themselves are first mentioned in the records with the opening of a Monkey School in the 1780s. But they were probably living at the Tower a long time before this — indeed, there's plenty of evidence that fashionable ladies and gents had been keeping monkeys as pets for years, such as the oblique mention of a pet monkey in Pepys's diary of January 1661. In the late 1800s, the Tower monkeys lived in a furnished room, with shelves and a fireplace where visitors were apparently completely charmed by their antics and humanlike behaviour. As has become the fashion with monkeys in London zoos, the animals and visitors were allowed to roam freely together, with the monkeys pinching, climbing on and biting guests. However, the monkeys' freedom of movement wasn't to last. A guidebook from 1810 tells us that 'formerly several monkies were kept, but one of them having torn a boy’s leg in a dangerous manner... they were removed'. 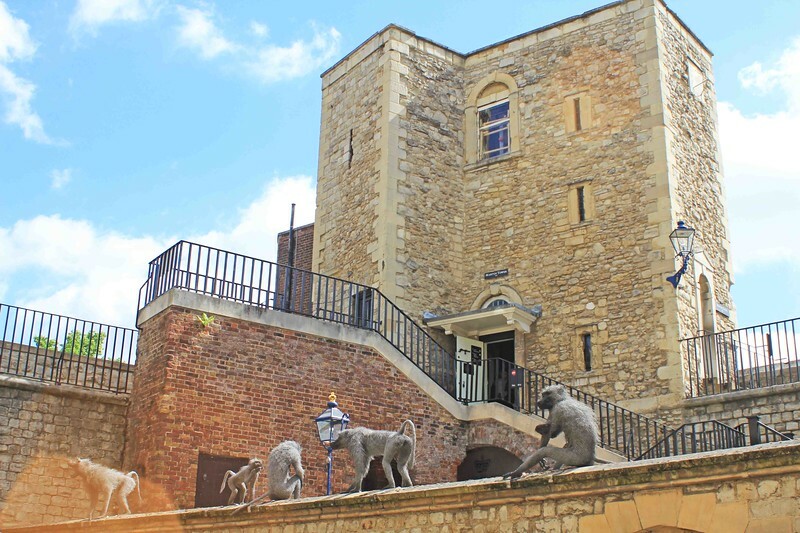 Today, in the corner of the Tower's walls outside the Jewel House, sits a troop of mischievous baboons: artist Kendra Haste's 2011 artwork commemorates the beasts who once called the Tower their home.